If you are wondering about filing a medical malpractice lawsuit in New Jersey, you need to understand the term “medical negligence” and why it matters for your potential claim. 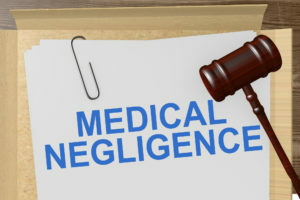 Medical negligence is defined as an act or omission by a doctor, hospital, or other medical professional while providing care, that deviates from the standard course of treatment in the medical community, and results in injury to the patient. The forms of medical negligence are highly variable, including mistakes associated with testing, diagnosing a condition, choosing a course of treatment, executing said treatment, providing postoperative care, and ongoing management of a medical condition. The fundamental premise of medical negligence is that the healthcare provider failed to provide care in accordance with the accepted norms among the medical community. This is known as the standard of care. It is important to note that although medical negligence and medical malpractice are often used interchangeably, these terms refer to different concepts under New Jersey medical malpractice law. Technically, medical negligence is one of the criteria necessary for a valid medical malpractice claim. Negligence refers to the failure of the medical professional or organization to provide an acceptable standard of care. In order to recover damages for medical malpractice, the negligence must have caused injury to the patient. What is Needed for a Valid Medical Malpractice Claim? The defendant failed to provide treatment that a similarly trained, experienced, and prudent medical professional would have provided in the same or similar situation. Failing to meet this standard of care is known as medical negligence. Negligence on the part of the healthcare provider caused injury to the patient. For a valid medical malpractice claim, negligence alone is not enough. The negligence must have resulted in patient harm. The losses associated with the patient’s injuries are quantified and assigned a monetary value, referred to as “damages.” Damages, or the compensation recovered in a medical malpractice case, can include medical expenses, lost wages, permanent disability, cost of future care, pain and suffering, and funeral expenses in the case of wrongful death actions. If you believe that you or a loved one suffered an injury that may have been caused by medical negligence, it is imperative to seek legal counsel from an experienced New Jersey medical malpractice attorney. The legal team at Fronzuto Law Group is here to answer your questions about medical negligence and to provide a free evaluation of your specific case to determine if you may have grounds for a claim. Please contact our office anytime at 973-435-4551 or fill out our online form. The consultation is free and so is our representation unless we obtain you a recovery.